Professor Celso da Costa Carrer, a researcher at the University of Sao Paulo and a member of Agroinncuba, has collected in two ebooks the knowledge developed and consolidated throughout 2017 and 2018 by this international network. It was borned to promote innovation and technology in the agrifood sector, sponsored by the Ibero-American program of science and technology for development (Cyted). Each of the publications includes, respectively, the conclusions drawn in the two international meetings that Agroinncuba has held in that period. The first one, entitled Propuesta y posicionamiento de la red iberoamericana de empresas agroalimentarias innovadoras, describes the role of each of the members of the network in their closest economies and, specifically, in the agriculture and food sector. It is based on the ideas that were highlighted in the first meeting of the network, held in 2017 in the Brazilian city of Santos. In parallel, the second ebook, entitled Diagnóstico de percepciones internas de la red iberoamericana de empresas agroalimentarias innovadoras and whose downloading will be possible in the coming weeks, synthesizes the key ideas to realize the third mission of the university, the transfer; in concrete, it explains how to implement innomediation ecosystems . These conclusions were formulated during the meeting held in 2018 at the University of Valencia Science Park (PCUV). 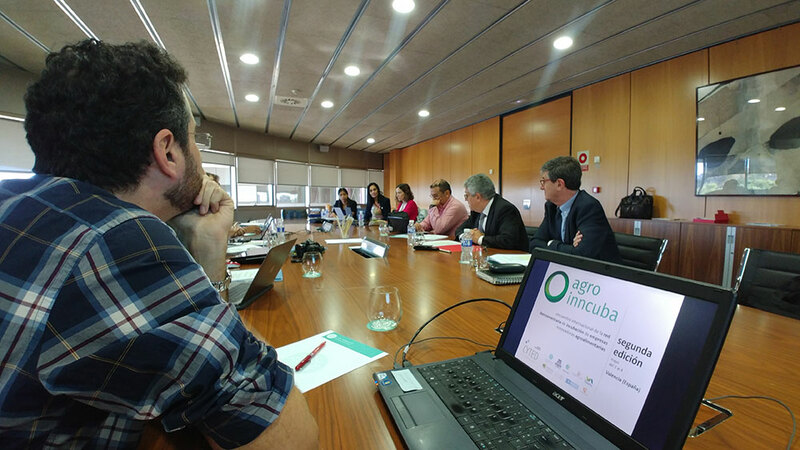 Among other aspects, the participants in the network have been defining guidelines for setting up incubators and science parks in order to improve the levels of development and consolidation of the innovative and technological business fabric of the agri-food sector in Latin America. Specifically, they advise on feasibility models, the constitution of the human team and the provision of high added value accompaniment services to startups and spin-offs. The ultimate objective is the creation of employment, wealth and economic well-being of the participating regions. In addition to these two digital publications, Agroinncuba has also published this month the Catalog of the Scientific-Technological Offer (OCT) of the Companies of the network. It includes the capacities, products and services that more than 100 innovative companies related to the AgTech sector and installed in the ecosystems created by the members, make available to the productive system. It contains data on the identity of each company, its technical specifications, its applications and the sectors of commercial interest. The diversity of business areas it covers - from Agriculture, Biotechnology and ICT, to Food, Environment and Advanced Services, among other areas of activity - makes this catalog a document of interest for a wide range of economic sectors. In this informative line, last April Agroinncuba published a Manual of Good Practices. It includes a series of successful cases in terms of innovation and management, which have been extracted both from incubators in the network and from incubators. "The ultimate goal is to promote, serve as a guide and inspire new initiatives while highlighting the importance of collaborative work", explained the director of the University of Valencia Science Park and Agroinncuba coordinator, Juan Antonio Raga. The international network Agroinncuba is sponsored by the Ibero-American program of Science and Technology for Development (Cyted). "Its objective is to strengthen the capacity of partner organizations in the provision of high added value accompaniment services in their incubated startups and spin-offs," said Raga. The institutions that comprise it are, by countries, the University of Valencia Science Park and the Autonomous University of Barcelona Research Park (Spain); Inovisa (Portugal); the incubator Minerva, of the National University of La Plata (Argentina); Incubatec, from the University of la Frontera (Chile); the business incubator of Agronegocio de Pirassununga UNICETEC, of ​​the University of Sao Paulo (Brazil); Parque Biopacífico and the Center for Educational Innovation in Engineering of the Autonomous University of the West (Colombia); and the Prehndo entrepreneurship center of the Universidad Técnica Particular de Loja (Ecuador).